Here is this week's Musing Mondays hosted by Rebecca at Just One More Page. For the full rules and for everyone else's answers, click the link. We all know the old adage about not judging a book by its cover, but just how much sway does a book cover have when it comes to your choice of book – whether buying or borrowing? Are there any books you’ve bought based on the cover alone? I am a sucker for a good cover, but I'm not sure I've ever bought a book for its cover alone. I've certainly discovered books based on their covers, but I have to have something more than a pretty picture before I'll actually read a book. Here are some random covers from books I read in my pre-blogging days. How influenced are you by a good cover? Man cannot exist by cover alone, but by what's under the cover as well. I have to admit, if the cover doesn't grab me, then I'm more than likely to skim over the book itself. However, with that said, I can't recall a time when I've picked a book based solely on the cover. I have to read the first couple of pages, the brief synopsis on the back, the passage sometimes included in the front...and on occassion...the last page as well. I am also a fan of good book covers but they are never the only factor in buying a book. However, how much I like a particular cover sways my decision as to which books from my shelves to read first. Covers influence me a lot, but page edges are even more important to me - if I spot a book with black page edges (The End of Mr Y) or gold (Hugo Cabret) it is mine straight away! I haven't been disappointed by a book with special page edges yet! First impressions really count with me, so a cover that is pretty will attract my attention first and may just end up in my basket! I am so shallow. I guess I'm a little shallow but it is important to me. Having said that, if a book is by an author I like or highly recommended, the cover doesn't matter. But I do like to look at gorgeous covers! A good cover does help though! I will pick it up and read the sleeve, otherwise I would walk on by. I am a sucker for cool covers. Cover aside, The Virgin of Small Plains is one of favorite books! I am a sucker for a good cover as well. I bought The Illuminator and that was one book I could never finish. But...I still love the cover. Maybe I should have it framed so it won't be a total loss. I bought that pre-blogging days also. 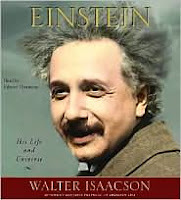 I do love the Einstein cover though and have wanted to read it. I do love a good cover and while I may not have bought any books based on the cover alone, I have certainly picked them up based on that. I'm pretty influenced by a great cover, actually. If the summary doesn't 100% grab me, but the cover is stellar, I'll still want it. I love a good cover. Like you, if I see something that grabs me it will certainly draw me in to read the back cover. In that way covers are extremely influential as there are many books I'd likely never have heard of or purchased had the cover not drawn me there. Also, like you, I've not purchased a book based solely on the cover. I'm simply too nosy about the story to allow that to happen. An interesting cover will grab my interest but the book itself is the key. I don't think I've ever bought a book based on the cover alone. I've got the Einstein biography in my TBR stacks somewhere. How did you like it? I love a great cover! I have discovered a lot of books I wouldn't have found if their covers hadn't been so interesting. I've never purchased anything just for the cover, but have picked up lots for the cover alone. I also fell for The Illuminator because of the cover. Sadly, I have yet to read it. Book design is very important to me and I find that publishers almost always know to put their best material in the best wrappers. a great cover will get me to pick it up and take a closer look...and that is half the battle in making a sale, isn't it? love the Dunn cover...see, I would take a look at that one. Those covers are great! I especially like The Illuminator. I don't base if I'm going to read a book on the cover alone but I am a sucker for a nice cover and that is what, a lot of the time, attracts my attention first. A good cover will grab my attention, but ultimately it's the synopsis that gets me to buy it. I'm lucky - my favorite genre, historical fiction, has the prettiest covers! I've never bought a book just because of the cover, but it's always a bonus when the cover is great. I also like covers that don't give anything away and you figure out the relevance as you read. That's fun to me. Count me in the me too column. I don't buy just because of the cover art. But, if the plot on the back cover or the end flaps appeals I will buy. I like your covers too. Oh, what an adorable collection you have there. It is quite difficult to say which ones are best, but perhaps the one with the stiff (crime lover´s point of view), or The Virgin of Small Plains (for its beauty). I'm the same way. A cover may catch my attention and encourage me to take a closer look at the book, but I have to interested in what the book is about to actually decide to read it.